Radiolab is a fantastic radio show about the science and mystery of things such as mechanical turks, broken hearts, and symmetrical molecules. It also boasts a soundscape of loopy, intwerwoven gibblets of dialogue and sound that make the experience of listening actually worth, well, listening to. It's radio done in a way that lives up to the strength of its sensory limitations. Jab Abumrad, a co-host along with Robert Krulwitch and a musician by training, was recently named a MacArthur "genius." If you're not listening, Ira Glass explains why you should at Transom. 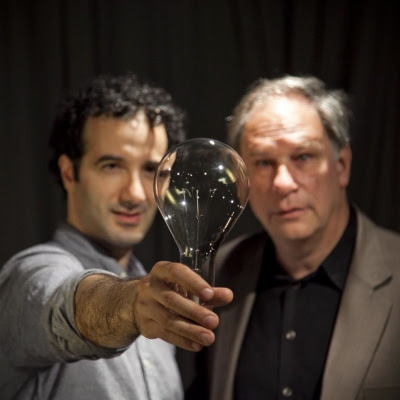 If you want to read more about the sound of Radiolab, Nieman Journalism Lab has a nice bit on that. Also, The New York Times had an interactive widget that let you play with the Radiolab sound a few months back. It's cool.